Trane thermostats control the heating, ventilation and air conditioning, or HVAC, system in your home. 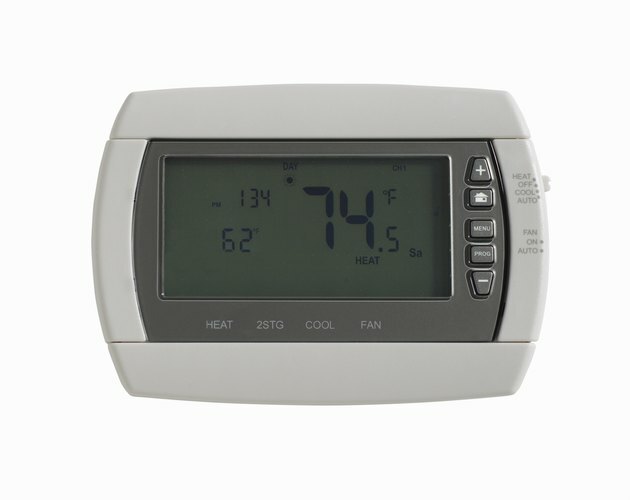 Through a thermostat function, they provide the "On" and "Off" switching of the equipment that keeps the home comfortable. They also provide energy savings because the heat or cooling is only provided when needed through functionality of a programmable timer. The cost of replacing a Trane thermostat can be made up in energy savings. Turn the power off at the home's circuit breaker panel, or fuse box. Flip the circuit breaker for the HVAC system, or remove the fuse. Remove the security screw at the bottom of the existing thermostat by turning it counterclockwise with the screwdriver. Pull the existing control head off the back plate. A clip may be found on the underside of the control head; if so, depress it. Unplug the wiring harness, which is the plastic terminal with colored wires attached. You shouldn't have to make any changes to this wiring unless you are adding equipment, like a cooling system. Snap the wiring harness into the new control head, and turn the power back on by flipping the circuit breaker back into its original place or replacing the fuse. Press the "Configure" button for three seconds--it's on the back of the control head. A wrench-shaped icon will appear on the display. Scroll through the option numbers and choose the values you need. The thermostat will automatically set to its default option. If you would like to change from the default, refer to the thermostat's instruction sheet (see Resources) for the full list of options. Ask an installer if you need help identifying your system. Exit the configuration mode by pressing the configuration button for two seconds. Snap the control head back onto the wall plate. Install the security screw at the bottom by turning it clockwise with the screwdriver.